A couple of years ago, I was validated and inspired by Ms. Donalyn Miller’s The Book Whisperer. If you have not yet read this book, it is a must. 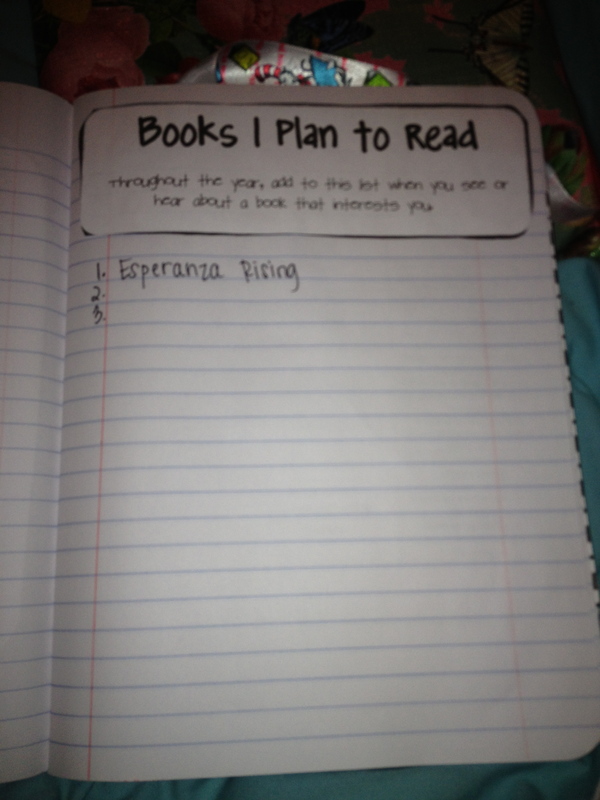 Immediately after turning the last page, I went straight to my computer and tried to format and create an effective and explicit way to begin a book challenge. I cannot express enough how this program has not only liberating me, but also my students. See you later points, benching students with a book in hand, read only at your level regardless of your interest, ugh. I’m over all of it. 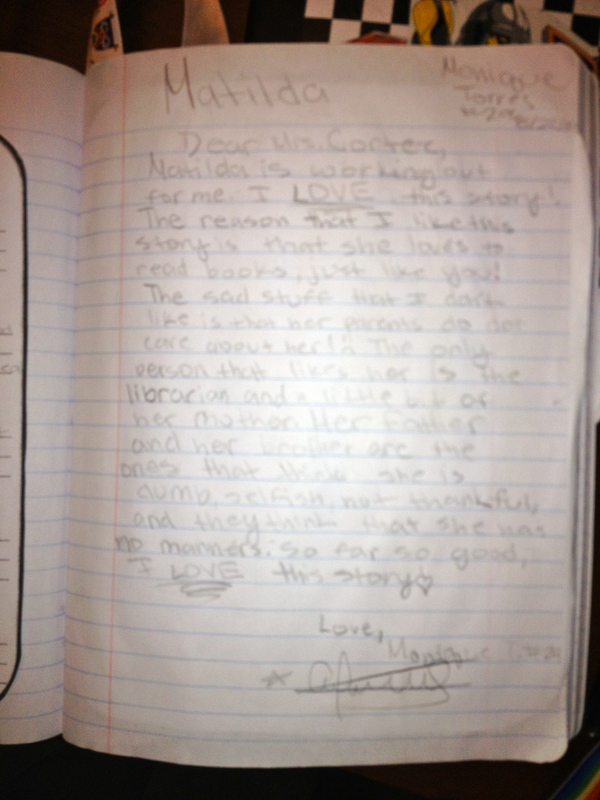 And Ms. Miller’s book allowed me to feel confident to do what I knew was right all along. Let’s teach and treat our students as real life readers, so that there just might be a chance for them to unlock and cherish the joy of reading as we all do. This post will be a number of pictures to better visualize how this might work in your class, tips and lessons learned over the years. On display for Open House! Students were so proud of all their hard work. Tchr beaming! We tallied up the total number of books read for each group then the entire class. Fantastic! Love to celebrate our reading accomplishments as a whole! 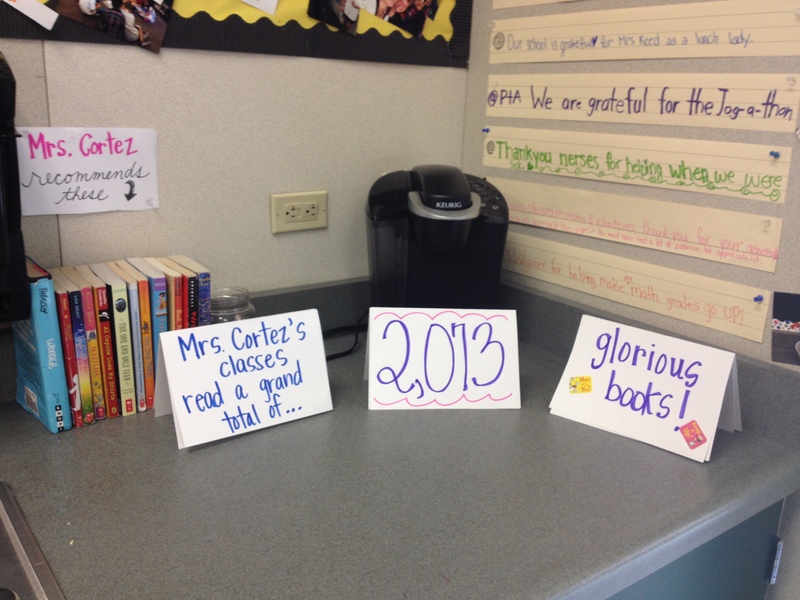 At the end of the year, we tally all the books we read as a whole. It’s an amazing feeling of accomplishment! Sts are so proud! 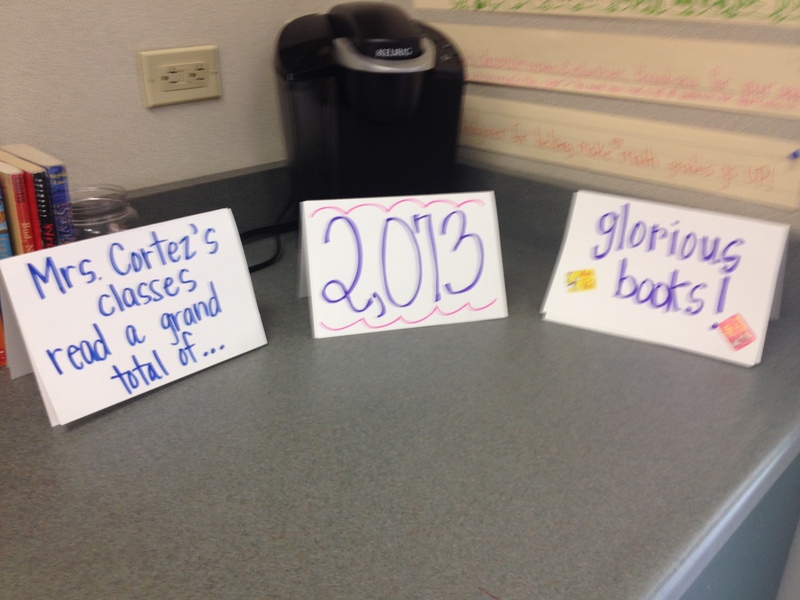 We sort of make the “reveal” of the total number an event in our class. All our celebrated for their contribution. Get rid or your “extra” stuff. You know, the “What can I do when I’m finished?” type work. Just let them READ if they finish tasks early. Start reading children’s books now! You need to be able to recommend and guide students to fit their interests and needs, and you can’t do that unless you have read a great number of your grade level’s books. This was my favorite part of this endeavor. I now choose to read young adult or children’s novels because they are sooooo amazingly crafted. It’s been enlightening and kept me “in-touch” with my students. 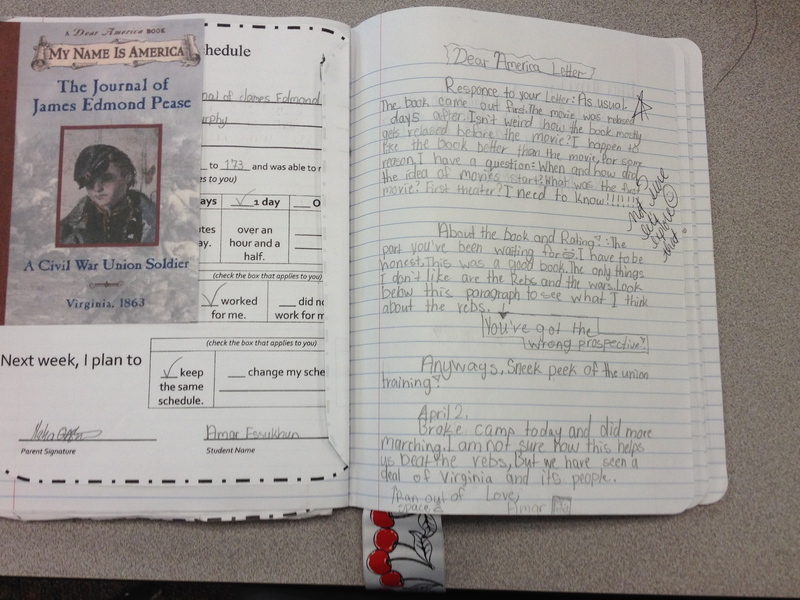 Allow students to abandon a book. 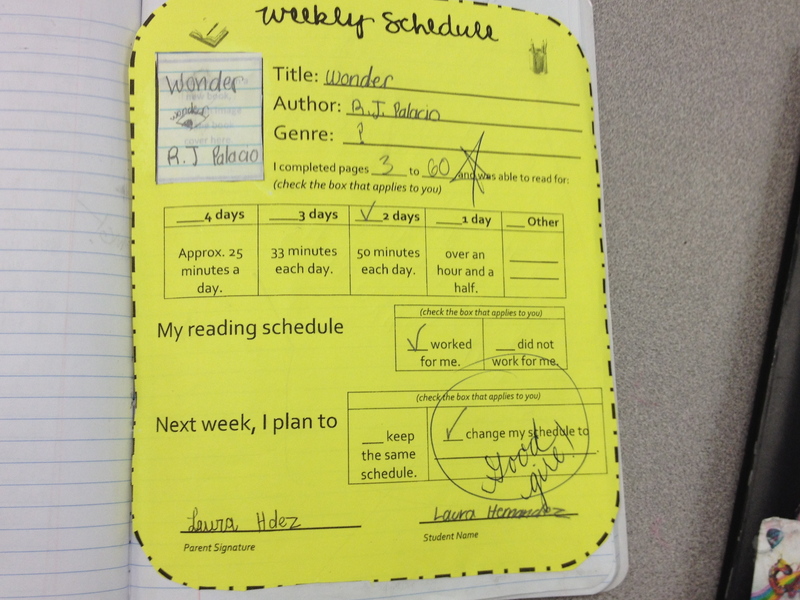 It’s up to the teacher, but my “rule” was that students could only abandon 2 books a trimester. 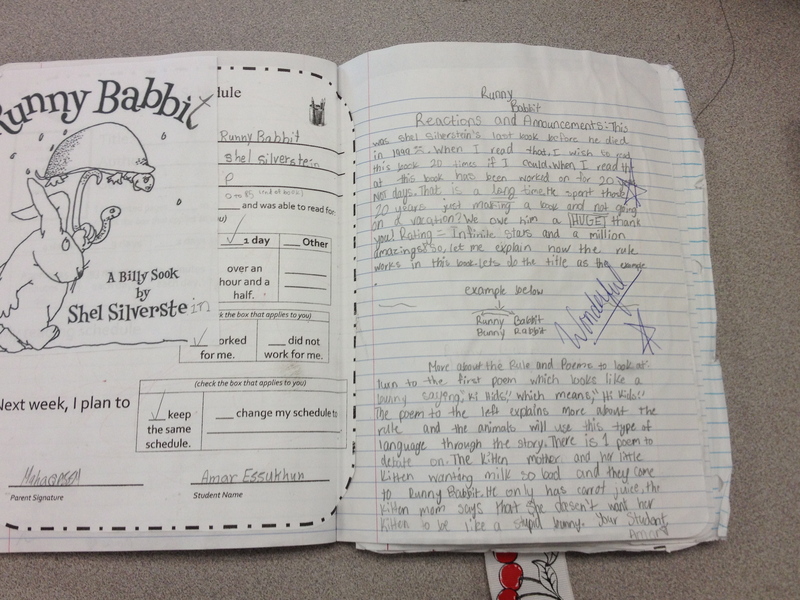 They had to write a letter explaining why they wanted to abandon this book, only after they had given it a solid try (i.e. read 50 pgs. or a couple of chapters). Any book you read aloud to the class whether it’s a picture book or novel counts towards their challenge. Share what you are currently reading energetically and often. Let them recommend books to you and actually read them! 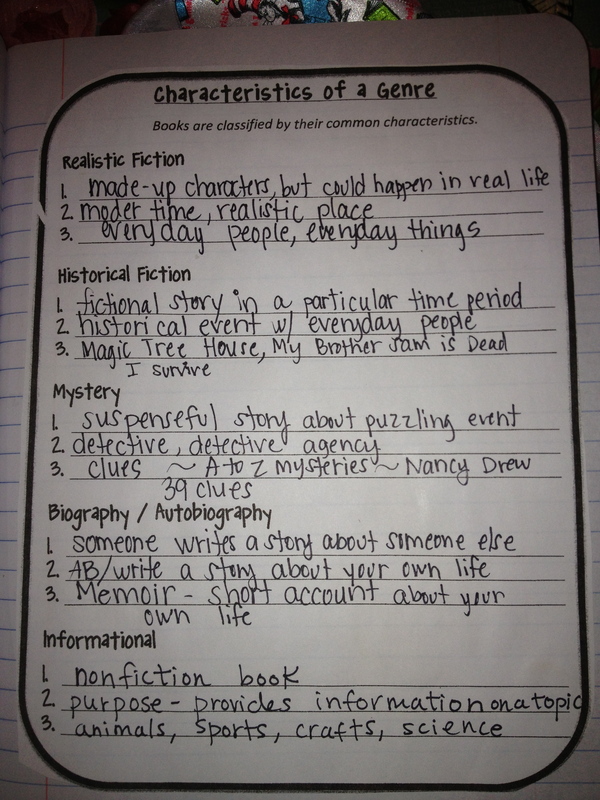 Make a book recommendation wall or system. 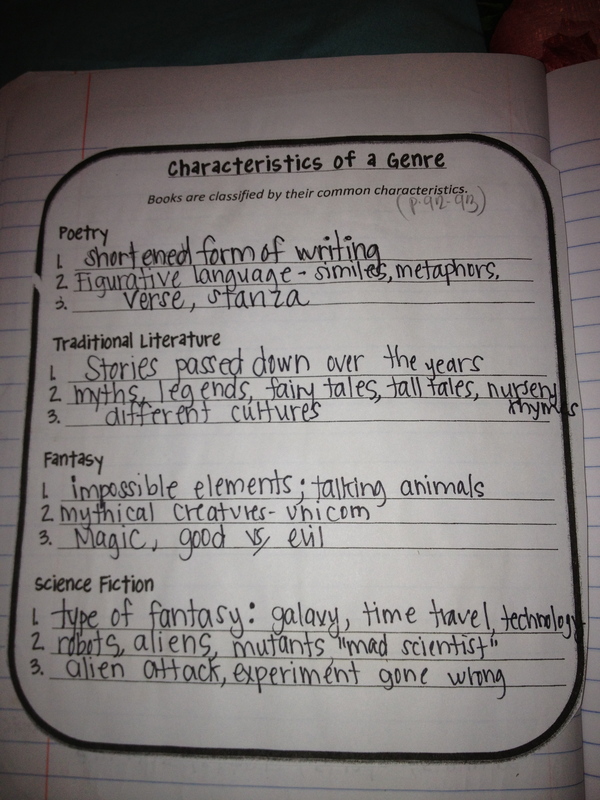 Because you are requiring reads of certain genres, this will help students select ‘good’ stories. Seeing what their friends have read is great motivation. 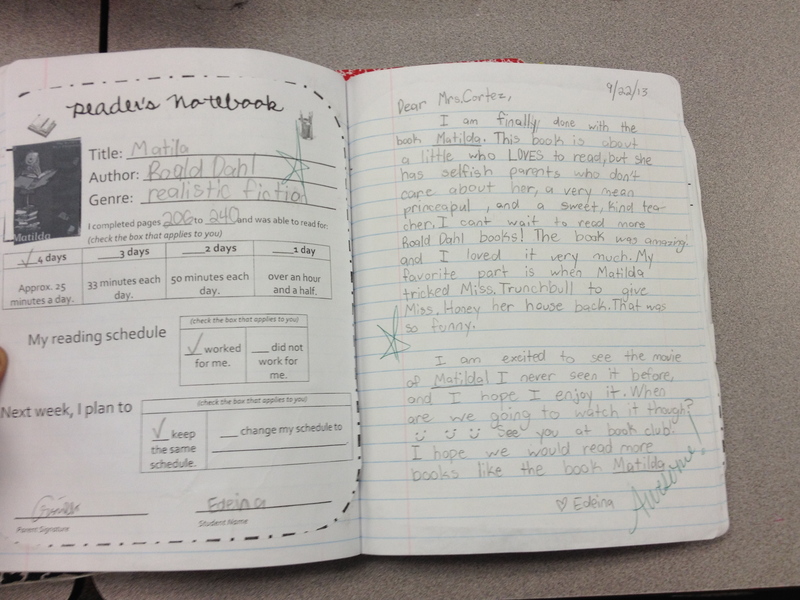 St. samples of Reader’s Ntbks in action! Rd. 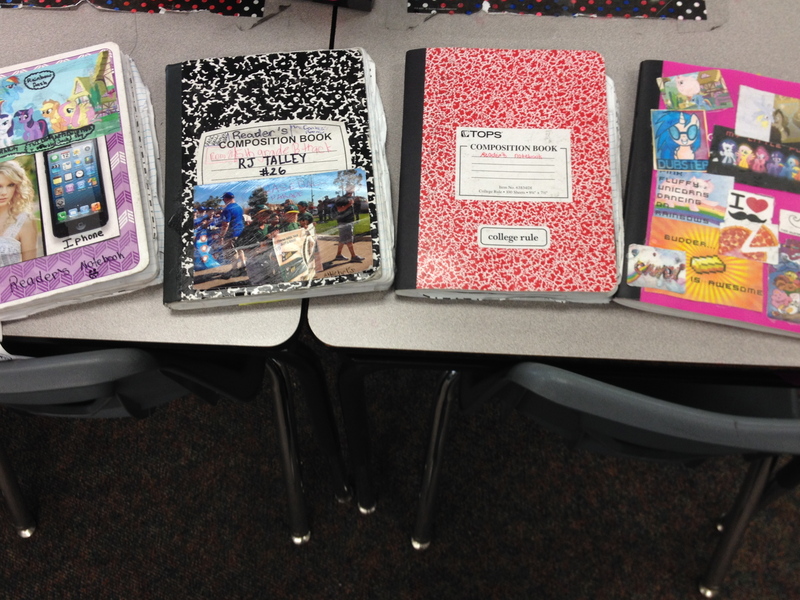 Ntbks used throughout the year. I loved the 40 Bk challenge! 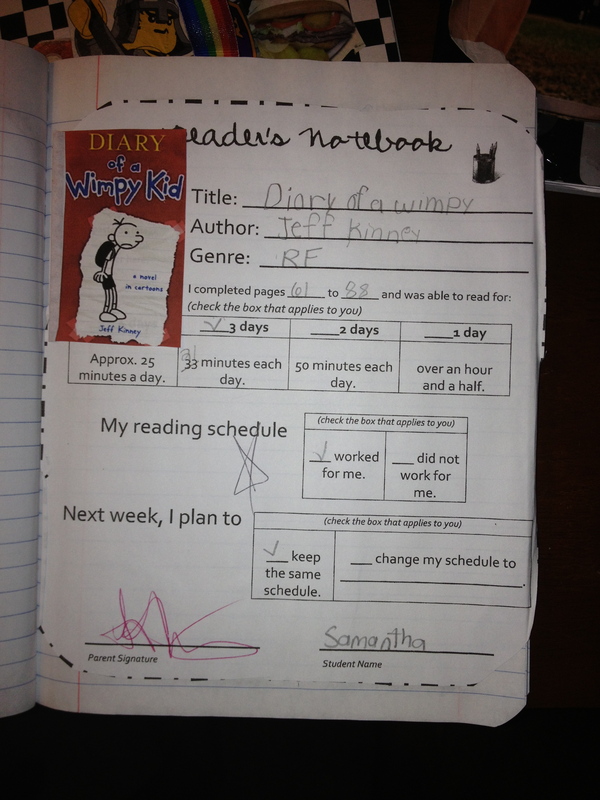 Check out how SHE marked, on HER own, that she needed to change her schedule for the week. This is exactly the goal I wanted for my sts.–to be able to assess if they’re schedules worked for them a week at a time. 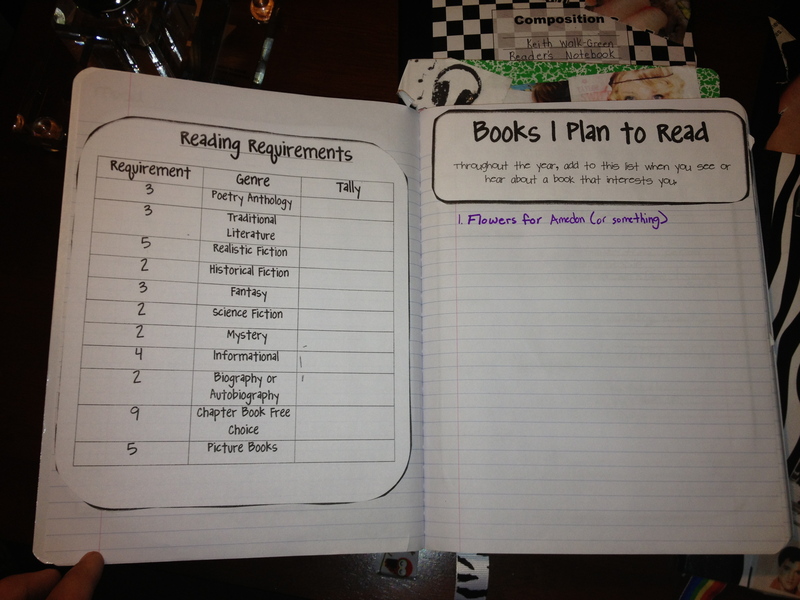 Self-monitoring to become real LIFE Readers!! 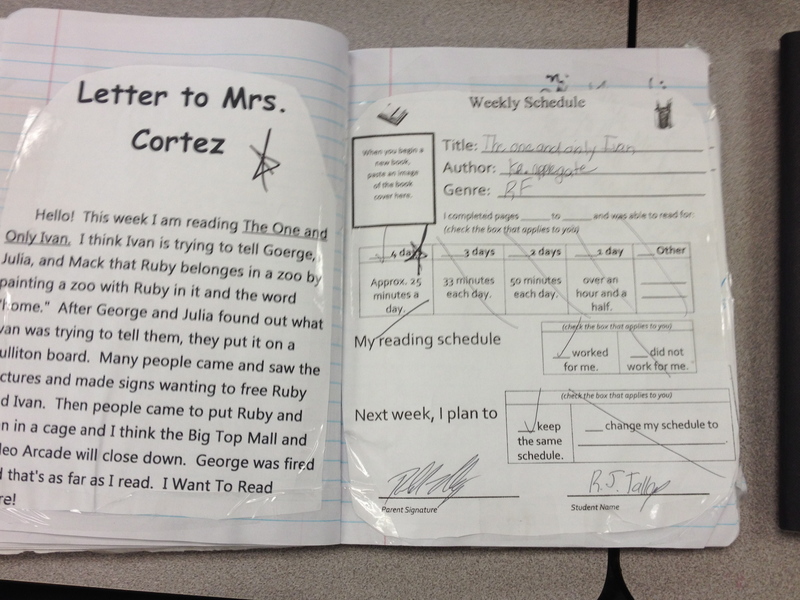 I annotate the letters to show I read them and model how that is diff for everyone. 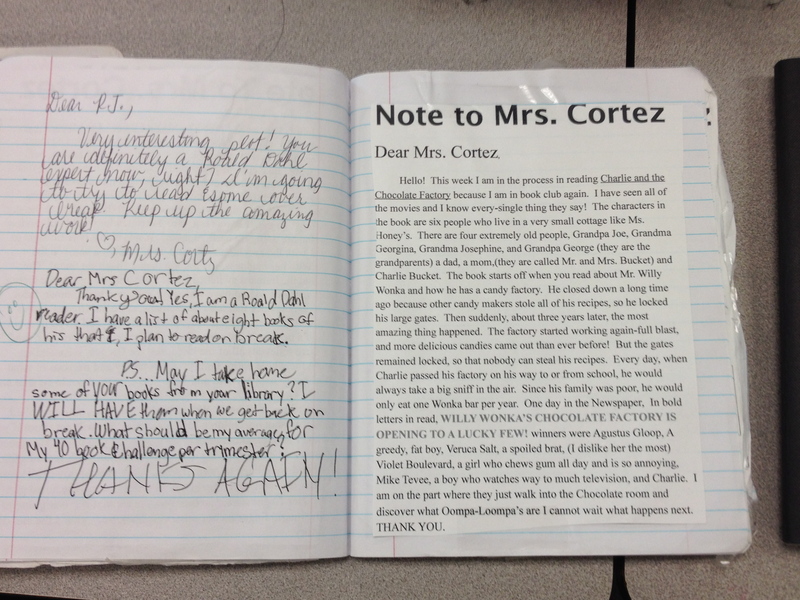 I also write a short response to kids each week. Sometimes they are a couple of words or a question, sometimes it’s a longer response. 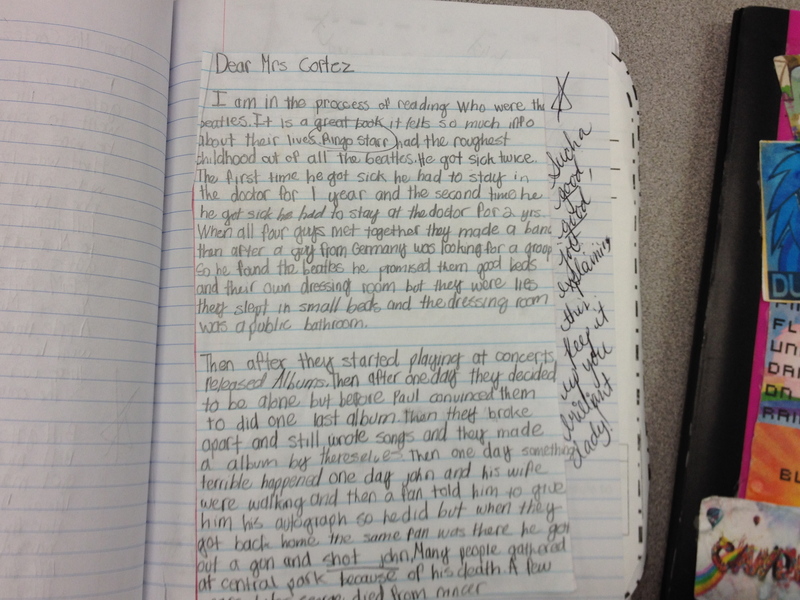 Some sts preferred to type their letter (or were asked to due to illegible handwriting). No problem here! Note the tchr-st exchange on the left side. IT was awesome! Sts. loved communicating to me through a letter each week. 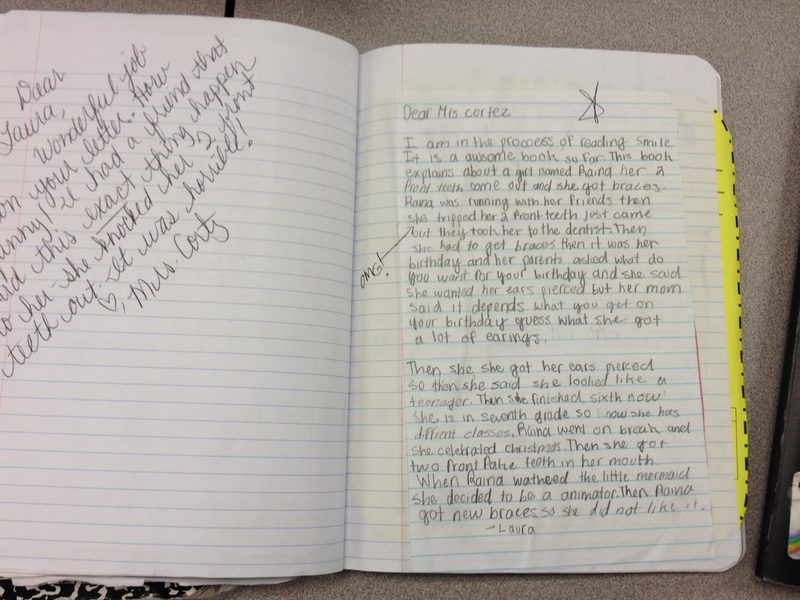 Another example of a typed letter then glued into their reader’s notebook. Up to tch discretion. An example of simple annotations made by the tchr. 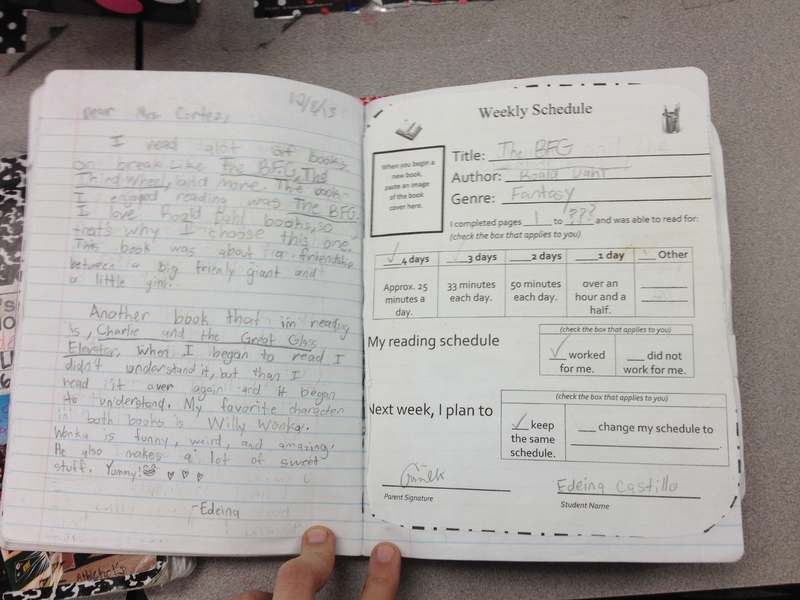 You don’t have to write a novel to each st every week! That would be impossible. Especially with more than one period. St. sample–simple notes by me again. “Not sure. Let’s explore that.” Short, sweet, and to the point. Sometimes I simply wrote “See me” if my question was too long to write. 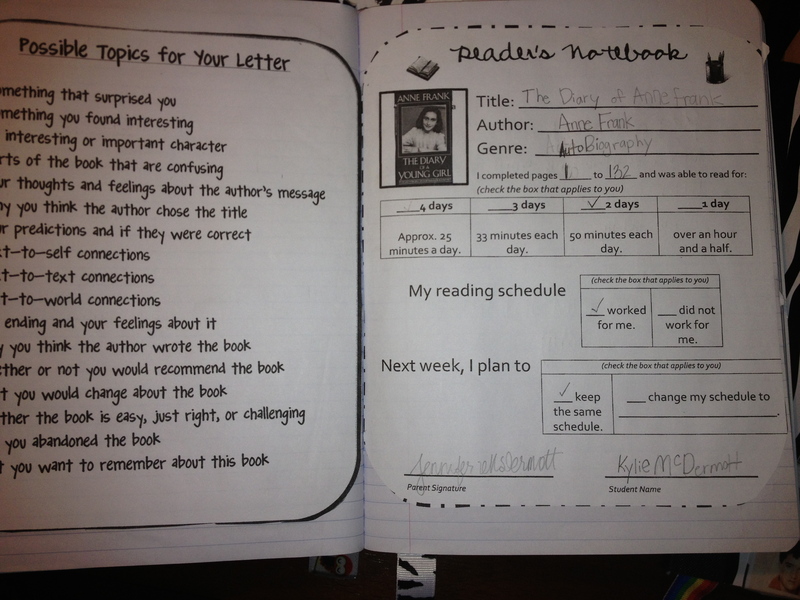 Reader’s Notebook: 40 Book Challenge! After much reading, researching, and deliberating, I have FINALLY decided on my reading incentive program for the year. I knew that I did NOT want anything to do with AR (Accelerated Reader). This program, while it has its benefits was not achieving my goal for the classroom, which has always been for students to love reading. If you haven’t read this book, go to amazon immediately and purchase it. Loved! Check out her site ASAP if you haven’t already. 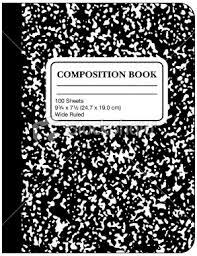 Composition Book with cardboard cover–standard. 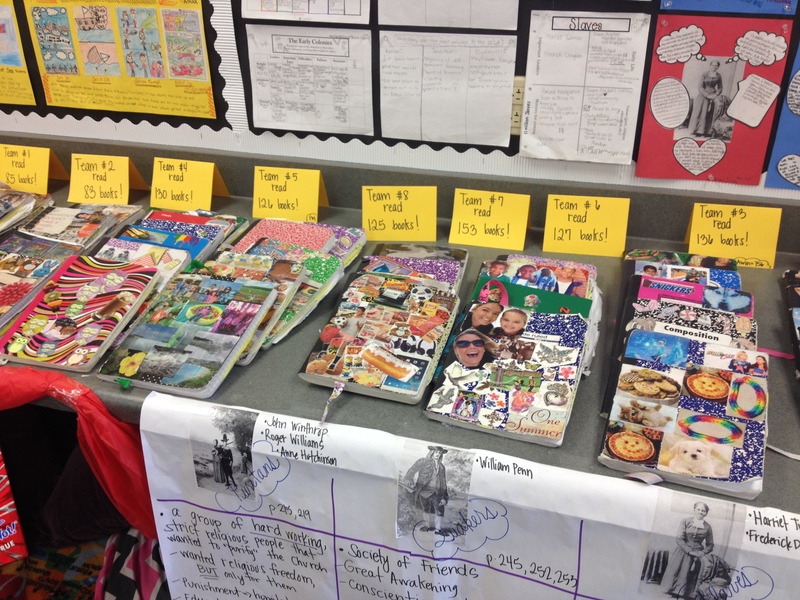 After introducing the book challenge, I passed out copies of the forms to be cut and glued in their notebooks. 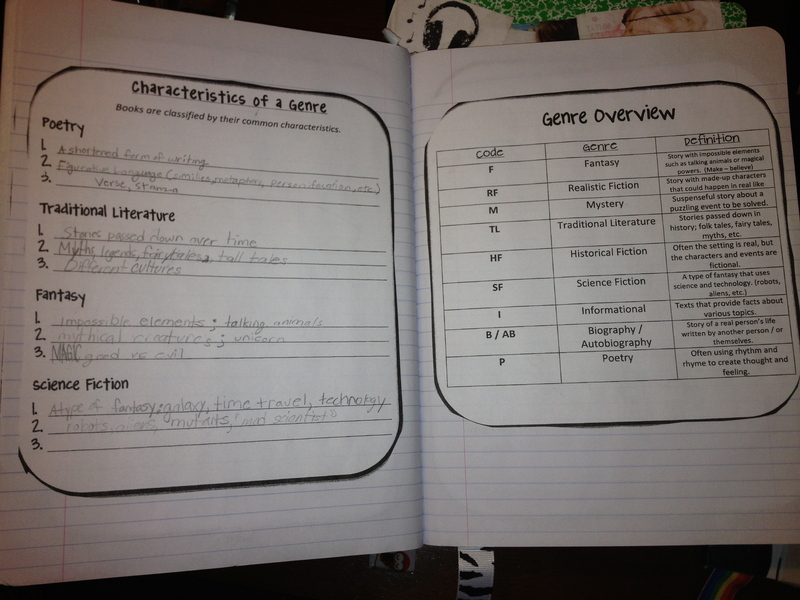 The forms included genre tally sheet, genre overview, characteristics of a genre (see “genre hunt”), weekly schedule accountability sheet, instructions for weekly response letter, sample of student letter, and more. The package can be purchased in my tpt store- Reader’s Notebook Book Challenge. Our first lesson was introducing all the genres (genre hunt) which I blogged about already, but it was really an awesome learning experience for me and the students. 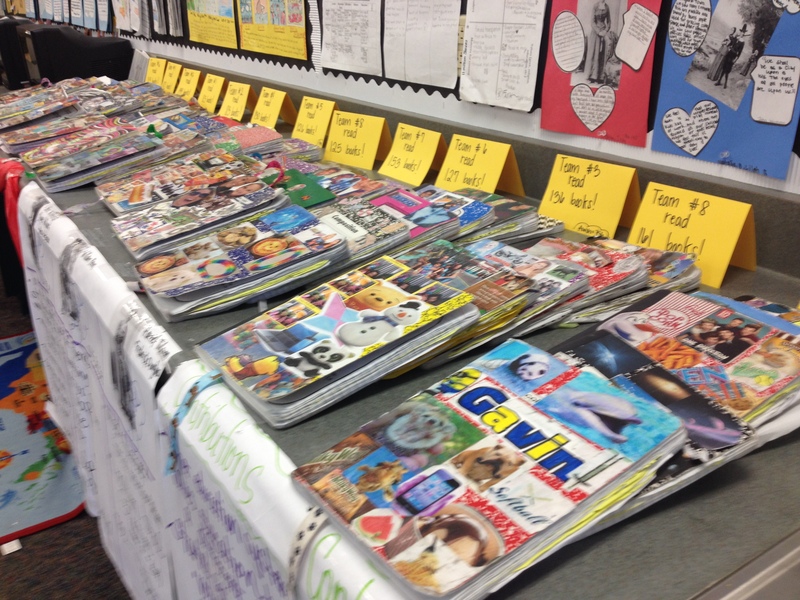 Categorizing books according to genre was more difficult then they had anticipated. We are now in the process of sorting the entire classroom library–yikes! and yay! So far, I am one month into my school year. I have blocked off 15 minutes for silent reading in the morning. (The Book Whisperer really helped in figuring out the logistics of this entire process.) It is during this time that I conference with students individually and/or in small groups of 3. 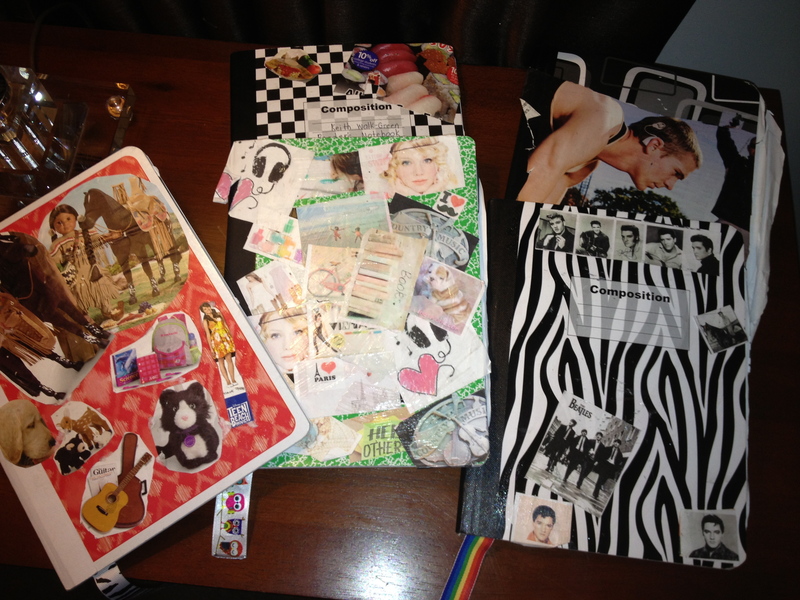 They bring with them the book they are currently reading and their notebooks. Sometimes I have them read to me. Other times we are discussing the book they are reading and how it’s working for them: are they on track to complete the challenge? If not, I try to steer them in the right direction. As far as keeping the students accountable for their weekly response letters, I have divided the class between all five days. 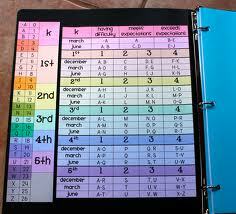 I have a group of students that always turn in their notebooks on Monday, a group for Tuesday, etc. This way I only have 6-7 students to read and respond to each day. I’m not sure how other teachers do this, but I would never trust myself to collect all 34 notebooks on Friday and have them back by Monday. So far, it’s working out well. A couple of days I even took them with me to lunch and completed them before school was out. 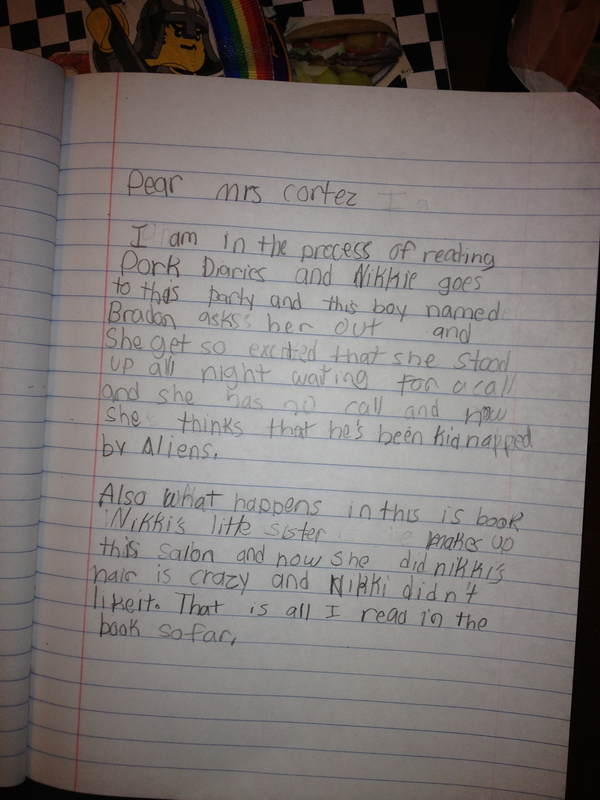 The immediate feedback and constant writing about reading has already shown benefits. I feel like I have learned my kids faster than I have other years. And not simply their academic skills and abilities, but their interests and personalities. It’s been great so I’m determined to keep it up. The following are some photos of my students work. I hope to see MAJOR improvements by the end of the year–fingers crossed!